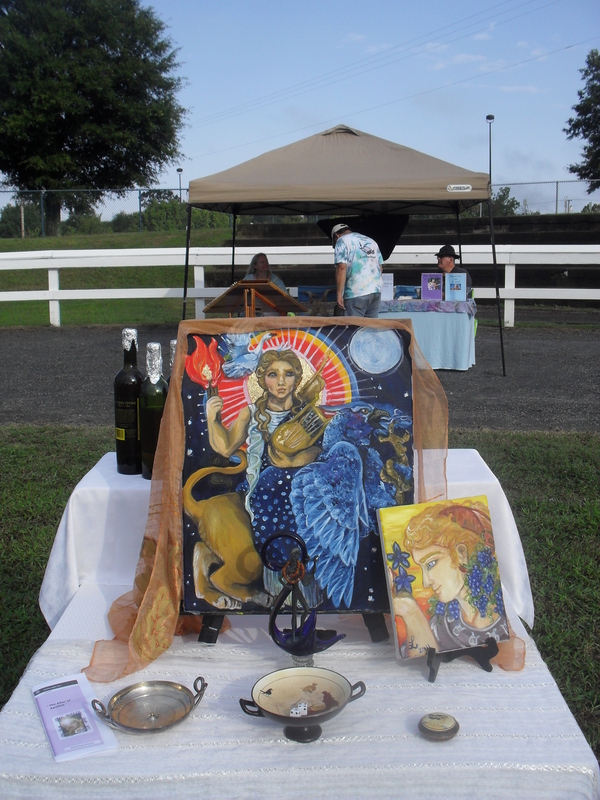 Truly I had a great time at the PPD, and I met some wonderful folks among the Pan devotees and a lovely stregonera who helped me set up (and donated some honeyed wine for the occassion for libations). The only downfall was that my printer ran out of ink so I wasn’t able to print out 50 brochures like I wanted to do, which resulted in the fact that half way through the festival someone decided to take home the brochure. But I was happy to see how many folks stopped by the Apollon altar and paid their respects to the god. Such a nice fairwell for him in the final celebration of the autumn equinox. In fact, when I went to pour the libations onto the earth at the end of the festival I was pleased at just how full it was (and as hot as it was it is possible that some of it may have very well evaporated). I was also pleased with how much folks liked the paintings I brought, both that for the Apollon altar and the one I donated to the Pan devotee group Panoleptos. And even I got a chuckle that a child less than 3 years of age won the Pan painting in the raffle 😉 Her daddy proudly proclaimed that it would go in her bedroom next to her Pan statue. So I know it is going to a good home where his painted beneficial gaze will watch over her as she grows. Another point that really brought me pleasure is that I was introduced to a young boy (about 9 years old) from the Heathen community who adored the Hellenic gods. So I spent some time talking with him and showed him about the Apollon shrine. And because I was so delighted with him (really he has alot of information stock piled which I found impressive) that I gave him the small painting of Apollon Karneios. I never saw such a face light up. He promptly brought his siblings over to see the shrine too. Apollon I am quite certain delighted in the children clustering around his shrine…and there weren’t any shortage of young pretty girls visiting it either hehehe. So overall it was a great success I think, and I have the pleasure of meeting some wonderful folks from the various groups…Heathen, Hellenic etc. And the neighbor I went with is interested in stopping by for study lessons and Hellenic rituals. A worship partner… finally… yes! Not to mention that my art got alot of exposure which may have set me up more or less for when I have my table at the Yuletide Bazaar (I just have to make sure to do images inclusive of other Pantheons as well…especially Egyptian and Heathen in addition to the Hellenic. So in short the day was not only a success, it totally rocked! Goods news is that I get to set up a public altar for Apollon, though granted only for a day, but still I managed to squeak in and get a space for the “semi-” local Pagan Pride Day. I usually don’t identify with the word pagan but I get the overall intention of the celebration, and considering the wide ranges of groups who will be there I won’t exactly be the only traditional polytheist there either 🙂 And that is a bit of a relief. So it is in a rather happy spirit that I am getting ready for by Altar for Apollon later this month. It is just unfortunate that I didn’t jump on board earlier so I could have had some Apollon-inspired crafts etc (particularly I wanted to do some sort of mask-making activity in which people can stare fear dead on…represent that which they are afraid of in honor of Apollon Boedromios whose festival Boedromia mythically marks Theseus’ sacrifice to Apollon and the issuance of fear (not unlike the representation in Homer’s poetic work the Iliad where Apollon is the bringer of fear as he weilded the aegis on the part of the Trojans) ) But next year, next year my dears. I will plan better get some things worked out firmly early enough! So this year it is just the altar. I should have my bust back by then, the one of Apollon that I bought at Delphi, to be the centerpeice. I wish I had time to make an image of Apollon Boedromios and Apollon Hyperboreos. The only things I have is my main shrine image (which I suppose will work in a generic kindof way) and the image of Apollon Daphnephoros that I am finishing up which seems a little out of season in my opinion. I still need to figure out the details of what exactly I am going to take with me, and how I am going to set it up. I have never done this before but it is an exciting new adventure to be sure! I know I am making a design for a local group of Pan for some prayer cards based off a painting I am doing for them that they may raffle off (at least I believe that is the plan hehe). So whereas I won’t have a painting to raffle off of Apollon I could do the similar idea (it was my idea anyway so why not lol) and offer small prayer cards. I am just not entirely sure how many I will need to print out. I don’t want to run short but on the other hand I would hate to have a surplus to throw away at the end too!